The Upper East Side is the chic and classic face of New York City - a neighbourhood captured in this luxurious watch that combines a white pearl and silver steel bracelet. 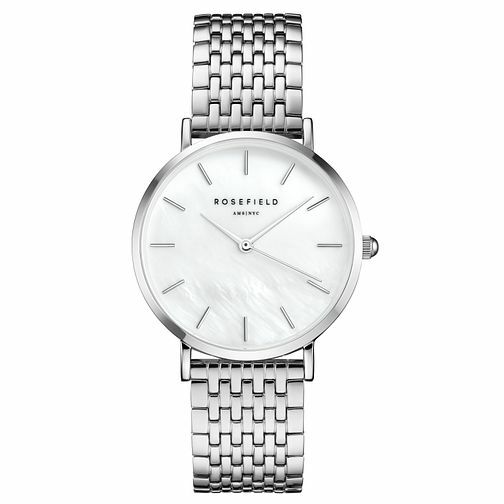 Rosefield Ladies' Stainless Steel Bracelet Watch is rated 5.0 out of 5 by 1. Rated 5 out of 5 by Anonymous from Silver masterpiece Wonderful product, very well packed. Refined in every detail, adds charm to every outfit, what makes me intensively think about buying a golden version from the same model. I'm absolutely in love with this watch and I recommend it to everyone.